Prof. Eleonora Cinti (Università di Bologna, Italy) will teach a 5-day mini-course aimed at graduate students and junior researchers at the intersection of Analysis and Geometry. Dr. Cinti earned her Ph.D in 2010 and since then has worked at the Max Planck Institute in Leipzig, the Weierstrass Institute in Berlin, and various Italian universities (Pavia, Bologna, Torino). 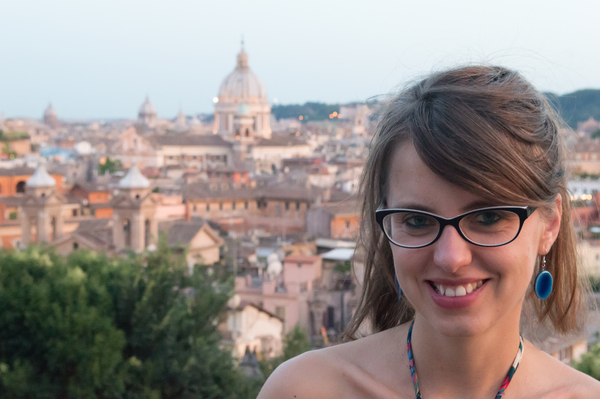 Eleonora Cinti's research focuses on nonlocal partial differential equations, geometric measure theory, and calculus of variations. Lecture 1 (Monday, May 20): Preliminaries: basic facts about the Laplacian and harmonic functions. Lecture 2 (Tuesday, May 21): The fractional Laplacians: motivations and properties. Problem Session (Wednesday, May 22). Lecture 3 (Thursday, May 23): $s$-Harmonic functions and the Caffarelli-Silvestre extension theorem. Lecture 4 (Friday, May 24): Geometry meets PDEs, a nonlocal phase transition model and nonlocal minimal surfaces. If you want to attend the mini-course, please email nonlocal19@queensu.ca. Congratulations to Stefanie, who was awarded the prize in the Community Collaborations category. Here is Stefanie’s commentary: Mathematical thinking is about finding patterns and structure. As a woman in the mathematics PhD program, I hope to inspire young women to follow their passion and find beauty in mathematics. At Queen’s we offer the MathQuest camp for high school girls. As captured in the photo, I am brainstorming ways to teach game theory and linear algebra. This is also a part of my research with Dr. Peter Taylor, where we work with teachers across Ontario looking for innovative ways to incorporate mathematical thinking in education. We hope to change the math curriculum by making it a more engaging, positive and memorable experience. The 2019 Art of Research photo contest received more than 100 submissions from Queen’s faculty, staff, students, and alumni, who took up the challenge of capturing their research programs in engaging and thought-provoking ways.